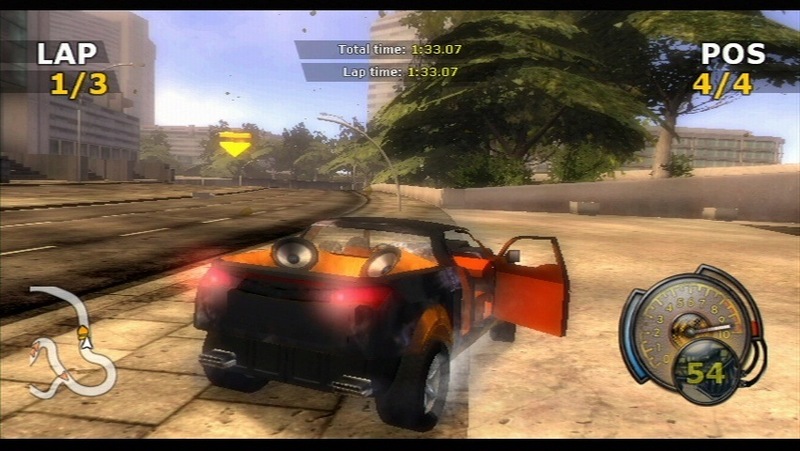 FlatOut is a budget Wii racer developed by Team6 Game Studios and published by Zoo Games in the USA. Sporting a debut price of $20, FlatOut can be summed up as a Budget Burnout or Casual Burnout – and in some ways this is a good thing, cuz you could’ve done worse by getting $50 of debut-disappointment on any of the FOUR Need for Speed titles on Wii. There are obvious limits on the scope and features of the game, but I could immediately tell Team6 was very serious about this project based on one of the very first screens the game loads: a note on the detectable range of Wii Remote tilting angles. “THAT’S all the turning you’re gonna get, and all the turning you need, so enough of your crying,” I imagined them thinking during the design phase. These guys care. 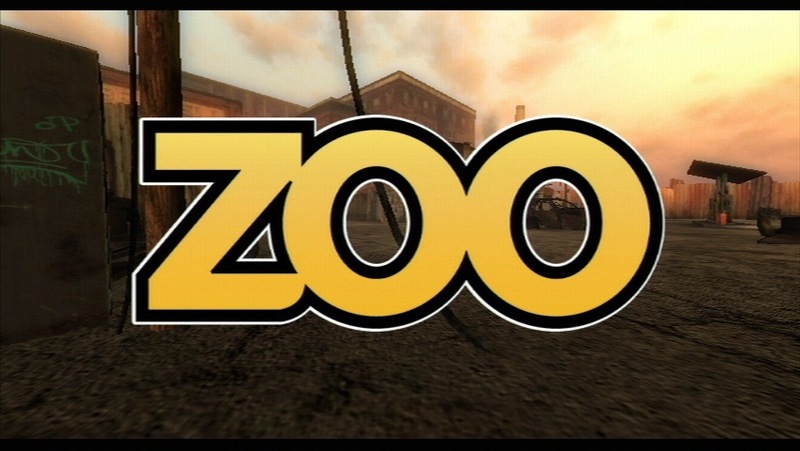 I could also tell Zoo Games was proud of the final product by the way they proudly fill the screen with their logo just before the title. The game offers 4 modes, none of which are online in any way. Aside from standard racing, there’s: “Stunt Mode” – abuse a rag-doll person by launching and crashing it into a target for points; “Battle Arena” – chase and collide with other cars to damage them; and “Car Basher” – an odd waggle minigame that’s basically the car-bashing minigame from Final Fight/Street Fighter II, having nothing to do with driving. I didn’t spend much time with these 3 modes; I simply desired to DRIVE. 2-player vertical split screen is available for all driving modes. There’s 12 tracks derived from 3 locations (urban, industrial, and “old” European), but half of them are reversed (which I’ll take over Mirror Mode any day). Breakable, helpless objects like concrete planters and exploding barrels are scattered along tracks to slow you down or invite your rage. I liked the variety of turn/corridor/jump designs so far; the turns looked familiar, but using the Wii Wheel brought a new level of satisfaction (compared to the analog stick racers I used to play last generation). I’ve seen some opposing AI traffic in the form of innocent yellow taxis, but their population is much smaller than the motorists found in the Burnout series. And in a move that rivals PS2’s Grand Touristmoose 4, only a maximum of 4 racers compete in a track. The AI even have gangsta street racer names like “Bob.” Seems to be about a dozen vehicles available, maybe unlockable in sets, with only a handful available at the start. I suppose they look like generic fancied-up street racers. I hardly see my car because I drive in first-person/bumper/cockpit view exclusively. Traditional third-person views are available (default). FlatOut only supports the Wii Wheel (Wii Remote tilt) for input, so kudos to Team6 for recognizing fist-worthy controls. To be clear, they say 70 degrees is the maximum tilt angle that’s recognized, but 90 degrees still works: greater than 70 is “the same” as 70, so hitting that range just ensures your wheels are turned all the way. You accelerate, you brake, and it’s up to you to figure out how to drift effectively and negotiate jumps/drops in an individual stage, including the mild tuning options for your car. Turning isn’t completely forgiving as you do have to worry about spinning out (all the time?). Significant contact with anything damages your car, and you earn points for that plus any stunts and other phenomena. I don’t know what the points do nor how damage/health affects driving, but killing your car boots you from the race. Like Burnout, you can drive hazardously to build up a boost meter. Besides going faster, boosting heals your junk wagon, restoring its good looks. A slow-motion ability also exists, but I didn’t see how it was helpful in 1st Place. 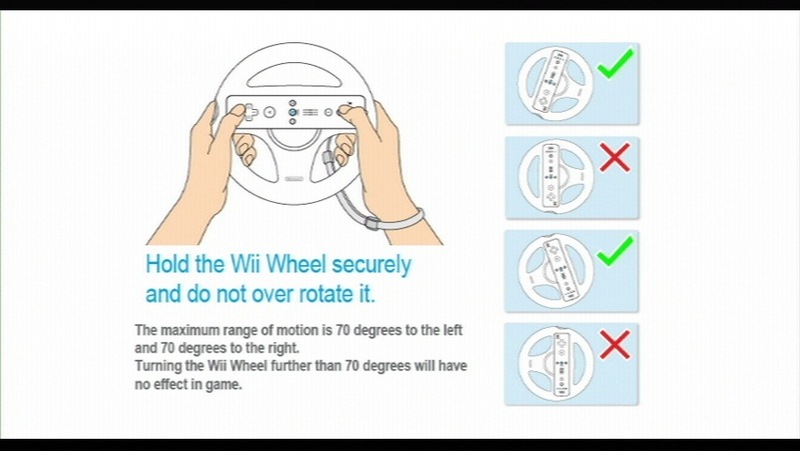 I’d say the game is well-adapted to Wii Wheel handling and just feels great. For a 3rd Party BUDGET Wii title, FlatOut is actually visually impressive. 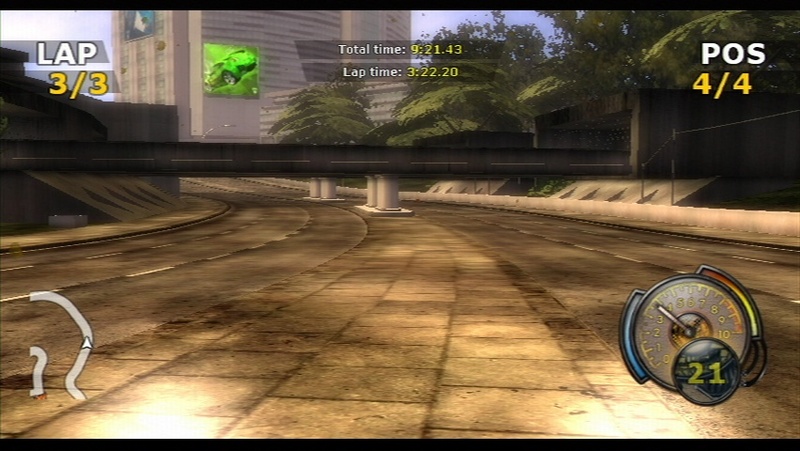 It looks better than most Wii racers, period. Did Team6… try? The game has a decent set of features including bloom, dust/smoke/flame, motion blur, zoom distortion, dirty texturing, and some lol-doll physics in Stunt Mode, doing a good job of sticking to 60 fps even in multiplayer. The body damage is convincing (lol GT5), crumpling/shattering to different degrees from a variety of angles, plus doors/panels flopping and flying off. Cars and objects can animate hilariously from collisions (you get what you put in), tho YOUR CAR’S self-correcting crashes seem questionable. On the downside, the frame rate can briefly dip during a mess of thick particle effects with animated body damage, but the dips don’t seem to disturb the fluidity. Driving in first-person erases your car from the screen and manages to keep the framerate at its best. The stages look decent, sporting moments of good street texturing, non-pathetic trees, and some high-poly background structures. Leaves fly around in the wind just because. And maybe the blur and dust and bloom are sometimes overused, cuz the smearing tends to negate the admirable texture details. However, complex structures/objects don’t really become part of the race track. That, and the general lack of motorists I mentioned earlier. If the cup is “half full”, the defficiencies do favor the side of playability. Team6 may exclusively focus on limited-resource projects, but they’ve got talent. The music is original to this entry in the series and, surprisingly, on the “good” side. I haven’t invested enough time to become attached to the generic rock melodies, but it was good enough to add to my mood and atmosphere (Peach Gardens this is not). I was pumped. This must be how Reggie feels when he drives to work in the morning. Shredding the streets, thirsting for bloodshed; racing to the office to resume some Dragon Quest IX. Sound effects are fine; clear, well-timed, and nothing out of the ordinary. Most of us non-gearheads won’t sweat the details between the sounds of various engine types. Sounds like an arcadey street racing game WITH car damage and pseudo-environmental destruction. No Dolby Pro Logic II support, unfortunately. I referred to this as Casual Burnout because the racing seems very forgiving. The AI opponents don’t feel threatening since I haven’t seen them exploit any boosts or rubber bands or Mario Kart hax. There’s no difficulty setting, and there are no race “cups” that force you into a series of tracks; just chose whatever track is unlocked. It takes effort to completely flip and incapacitate your car (taxi cabs launch nicely, he he he HA HA HA). The game will try to correct your orientation during crashes and wall climbs, pulling you down to resume driving. This invisible force is a little weird since I’m used to other games letting you lose control and emphasizing your failures. By itself, the core driving experience is fun thanks to the controls/visuals/audio coming together – to grab my Wii Wheel and feel the turns, feel the speed (in first-person). That might be a simple thing to ask for, but many Wii racers don’t seem to want to deliver, trying to bait customers with brand name licensing fluff or other marketing illusions of generic coolness (BAM! $50! KIDDIE GRAPHICS! NO ONLINE! WE’VE GOT WHAT YOU WANT, Wii GAMERS! ahaha!). Depending on your region and some uncertain release schedules, you could get FlatOut + Speed or FlatOut + Trackmania (fingers crossed for an actual, tangible, believable USA release) for the asking price of EA’s Need for Improvement racers. 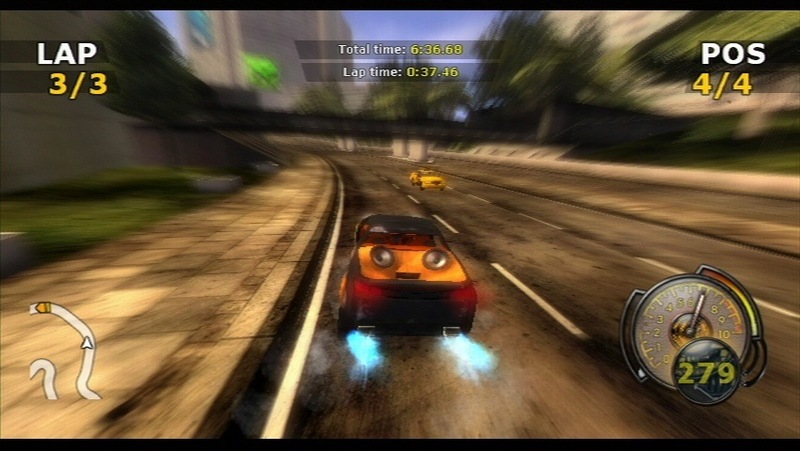 It’s not like there’s the option of a Burnout title on Wii, nor a Burnout 2 GC port (probably the last time I found that franchise interesting, haha, ugh). FlatOut has easily become my temporary arcade driving experience alternative to Mario Kart Wii. Reminding myself it was only $20 adds to my delight and relief. If Trackmania ever arrives, life might be complete. Note: Screens were made from direct feed 480p source. Team5 sounds like Team17’s younger sibling or something. Nice writeup, sounds like a reasonable game. You are correct, sir. There are 6 tracks that you get to drive again in the other direction. This is the kind of serious innovation that Mario Kart 64 is lacking.